Three Little Bunnies, originally uploaded by indiaeden. 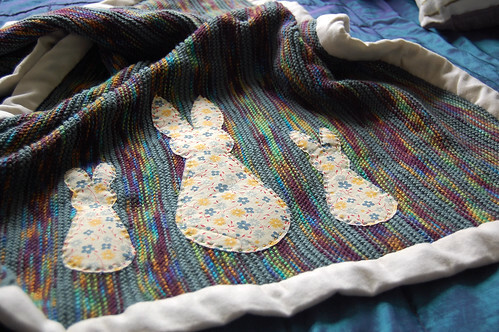 So, I kept on knitting until I ran out of yarn, then inspired by the Bunny Blanket in Vintage Baby Knits, I added three little bunnies in this lovely floral cotton, and bound the edges of the blanket with Killington Flannel. Lots of hand stitching, which I always find therapeutic, and I'm really happy with the "homespun" finish. There is a lot of love in this blanket, and I think it's going to the hospital with us. What a beautiful blanket. That yarn looks beautiful to knit with. It's lovely. Lots of love in it. I am, as ever, completely in love with what you've made. It looks just beautiful! I'm with Catherine. Take that to hospital. Can't wait to see baby boy all snuggly in it. (still busy busy with baby show.. then will get back to you). Gorgeous. Wonderful colours in the yarn. You can practically see the love glowing from that blanket.